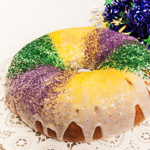 Mardi Gras king cakes make a festive centerpiece for any Mardi Gras celebration. 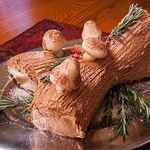 The traditional cake is made from a soft yeast dough that is risen, rolled, and often filled with cream cheese, fruit, or a pecan praline mixture. 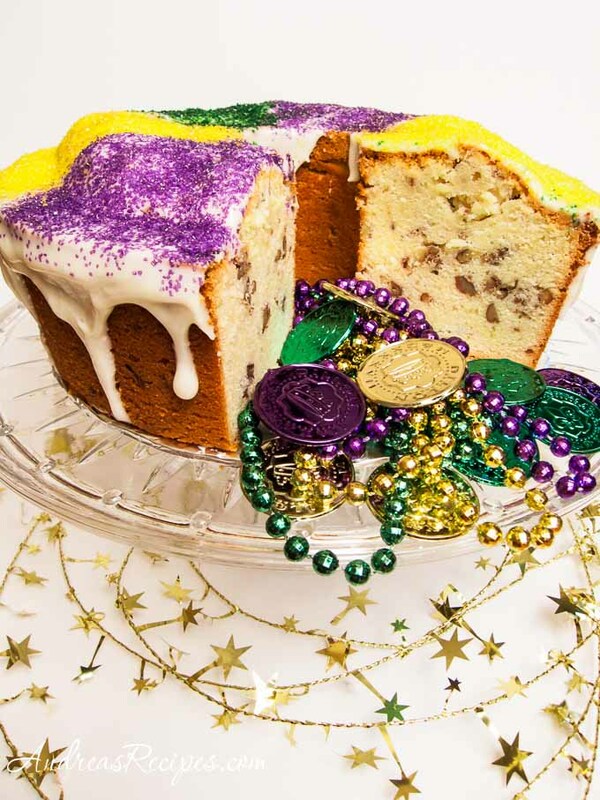 Many people have fun celebrating Mardi Gras, even if they don’t go to New Orleans, but I’ve heard friends say that they want a cake that is easier to make. After mulling the idea for a bit I decided that I would make both a traditional rolled king cake and a simple pound cake and decorate both in the traditional Mardi Gras colors to show that a festive Mardi Gras cake can be easier to make. 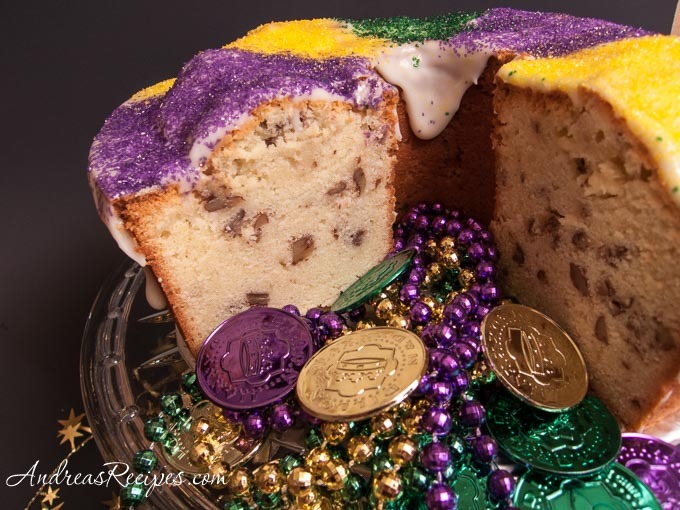 I knew that I wanted to have pecans in the cake in some way, perhaps like a streusel, so off I went in search of the perfect pound cake with pecans for my Mardi Gras cake. I stopped searching when I found this recipe from Southern Living. The cream cheese makes the texture moist and rich, and the bourbon adds just a touch of flavor that makes it feel a little more decadent without being obvious. Actually I was worried about the bourbon since I don’t care for the flavor by itself, but once I had a taste of the batter, I felt we had a winner. Bourbon has a strong taste, but once mixed in with the rest of the ingredients, the strong flavor disappears and leaves behind a perfume that works nicely. To top it off, I added a simple cream cheese glaze and the Mardi Gras colored sugars. Like a true pound cake, this recipe has no chemical leavening, and whipping the cream cheese, butter, and sugar adds air to help rise the cake. After getting the base fully whipped, take special care when adding the eggs and the remaining ingredients, as over mixing can leave you with a flat cake. I think mine was borderline, but still pretty good. The original recipe calls for a 90 minute baking time at 325° F, but my oven thermometer showed that the oven was cooler than that, and the cake was nowhere near done at 90 minutes. I continued cooking 5 minutes at a time, checking the cake to see if the middle was cooked yet. Finally after 18 additional minutes the cake was fully cooked with a firm, moist crumb and a golden, slightly crispy exterior. I used a regular tube pan, but a heavier nonstick pan might cook the cake faster. I suggest checking the cake and watching it carefully to make sure it cooks properly, and at best I can only say that the cooking time is a suggestion. Still, we thought the cake was worth the little bit of extra effort in baking. I found the colored sugars at A.C. Moore in the cakes and candy section, but I’ve also seen them at Party City and Michael’s. Cake adapted from Southern Living, December 2004. CAKE: Set oven rack in the middle and preheat oven to 325° F.
In the bowl of the stand mixer, cream together the butter and the cream cheese. Add the sugar a little at a time, mixing on medium speed until light and fluffy. Add the eggs, one at a time, mixing on low just until the yolk is no longer visible. Gently fold in the vanilla extract and the pecans. Pour into the prepared tube/Bundt pan and bake for 1 hour 30 minutes to 1 hour 45 minutes, using a long bamboo skewer to check cake consistency. Skewer should come out dry, but may have a few crumbs clinging. Remove from oven and cool in the pan on a wire rack for 15 minutes. Remove from pan and cool completely on the wire rack. GLAZE: In the bowl of the stand mixer, cream together the butter, cream cheese, and vanilla. Add the sifted sugar a little at a time until the sugar is fully mixed in. Add milk a little at a time, mixing as you go, until the glaze drizzles easily from a spoon. Depending on humidity, you may need a little more or a little less milk. DECORATE: Drizzle the glaze around the top of the cake, allowing it to run down the sides. Sprinkle the colored sugars on top of the glaze. That cake looks gorgeous! I love the way your decorated and presented it! Really beautiful.Laissez les bons temps rouler ! So festive! Love the colors, green and yellow are our flag’s color, heeh. Wow, I must think of something for Mardi Gras! What’s a positively spectacular cake! It makes me smile just looking at it. Your boys must love it. Rosa, thanks! I had fun with this one. Courtney, thank you! I wish I could go to Mardi Gras this year. Cris, what do you make for Mardi Gras in Brazil? I love cream cheese pound cakes & this one is extra rich—yum! This sounds so so so yummy!!!! I can’t wait to try it. I just love your mardi gras cake!! I came here for inspiration..this king cake of yours look amazing, lovely presentation and photos.. nicely done!!! My mother and I just made 4 of these cakes for a bake off. They are simply AMAZING!! I followed the directions above to the tee! I did add a little brandy to the icing and sprinkled coconut on top.